Supplier & Manufacturer of Industrial Ceramic Fiber Braided Packing & Temperature Resistance Ceramic Fiber Ropes. 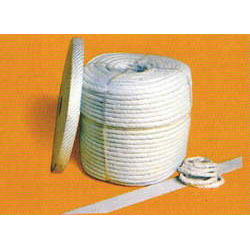 Our product range also comprises of Asbestos Yarn, Asbestos Ropes and Asbestos Textile Lagging Ropes. 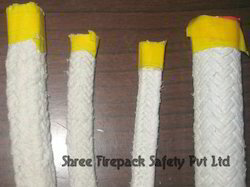 Our Company Shree Firepack Safety Private Limited is engaged in offering Ceramic Fiber Rope. 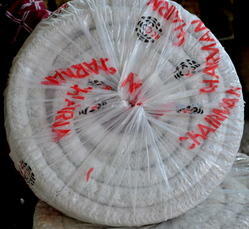 These Ceramic Fiber Rope are basically used for Expansion Joint Packing. We are the manufacturer, supplier and importer of Temperature Resistance Ceramic Fiber Ropes. Shree fire pack textile family includes Ceramic Fiber Rope, braids, cloth tapes, and sleeving. Ceramic fiber textile products are made from alumina-silica ceramic fiber, free of asbestos. These non asbestos textile materials such as ceramic fiber rope can be used in different industrial applications under temperatures up to 2300 °F (1260 °C) and have excellent chemical stability and strong resistance to thermal shock and corrosion attack. Exceptions are hydrofluoric and phosphoric acids and concentrated alkalies. Ceramic fiber rope also resist oxidation and reduction. If wet by water or steam, thermal properties are completely restored upon drying. No water of hydration is present. Ceramic fiber rope contain 15% organic carriers, which helps to establish physical formation of products. The carriers burn out at about 750 °F (400 °C). Ceramic fiber rope braided packings also contain reinforcement insert materials of either inconel wire or continuous fiberglass filament to increase handling strength during installation and enhance fiber durability to rated temperatures of 2000 °F (1093 °C) for inconel wire and 1200 °F (649 °C) for fiberglass filament. Ceramic braided packing includes Ceramic fiber rope are dense, high performance packing fabricated from ceramic fiber yarn braided around a core of ceramic fiber rope either to form a packing in Round or Square section of desired sizes. Replacement of asbestos rope for heat treat furnace, seals for stove and ovens, expansion joint packing, bulk in tadpole gaskets, gaskets and seals. Sealing of oven, furnace or boiler doors. Shree Firepack textile family includes Ceramic Braided Packing, braids, cloth, tapes, and sleeving. Shree Firepack ceramic fiber textiles are made from alumina-silica ceramic fiber, free of asbestos. These ceramic fiber textile materials can be used in different industrial applications under temperatures up to 2300 °F (1260 °C) and have excellent chemical stability and strong resistance to thermal shock and corrosion attack. Exceptions are hydrofluoric and phosphoric acids and concentrated alkalies. Shree fire pack ceramic fiber textiles also resist oxidation and reduction. If wet by water or steam, thermal properties are completely restored upon drying. No water of hydration is present. Shree Firepack textiles contain 15% organic carriers, which helps to establish physical formation of products. The carriers burn out at about 750 °F (400 °C). Shree Firepack ceramic fiber textiles also contain reinforcement insert materials of either inconel wire or continuous fiberglass filament to increase handling strength during installation and enhance fiber durability to rated temperatures of 2000 °F (1093 °C) for inconel wire and 1200 °F (649 °C) for fiberglass filament.